When "real life" people hear that I own a successful virtual business, they are usually puzzled or amazed. What will they say now when I tell them I have employees? You might be wondering what staff would do at a particle shop? It's pretty simple, really, they are doing what I often do at the store: talk to visitors and help them. I've found that it is a great way to ensure everyone has a good experience, and it's also the best way to find out what people are looking to buy. In spite of my efforts to make the store easy to navigate, trigger demonstrations, access informative notecards, some people still have problems finding items in the store. Perhaps they are simply impatient, or maybe they can't read. It's then that they really appreciate a friendly someone to guide them to the correct place. But this work does take a lot of time, and lately my Second Life existence seems to be getting busier than ever. So, after chatting with friends who make a not-so-great living camping, I realized I could provide a better paying job for them and handle visitors with a lot more care. After buying a timeclock (well, two of them, since the first one didn't do what I needed) and some negotiations, I have staff! This is definitely an experiment, and experiments are one of the actions I've advised Second Life businesses to do in previous posts: keep trying things. Eliminate that which doesn't work, and do more of that which does work. In this case, I intend to compare results before and after to determine the effect of in-store sales personnel. The best part so far: staff say, "This is so much more interesting than camping! You get to talk to people who aren't zombies!" In a previous article I described what I refer to as "Second Life Ergonomics". 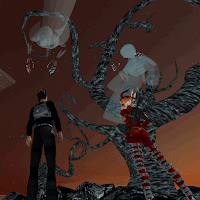 It's all about the appropriate design of virtual structures to make it easy for avatars to use and enjoy. My main complaint is that many builders tend to build virtual structures using real-life ergonomic considerations, and fewer realize that avatars have significantly different characteristics that must be accounted for. Here are a few tips that I have learned during my brief virtual existence (well, brief except for last week when I was online for far too many hours!) This list is certainly not exhaustive - I am thinking of new ideas all the time, and I am positive there many great ideas I have yet to learn. Phantom Objects - On those days when it's really hard to turn, walk and especially precisely navigate through a crowded area, it's really annoying to get hung up on items in your way. Yes, I know you should walk around them - but sometimes you just can't. TIP: Unless the object has some physical purpose make it phantom. That way the object cannot interfere with an avatar's motion, but still adds to the visual effect. Don't phantomize objects that require physical characteristics, such as furniture to sit on or ramps to walk up. Solid Objects - I can't stand it when I am trying to walk along a narrow path and end up falling off the side, sometimes to my virtual death. Why does this happen? Because the builder didn't account for the sloppy avatar movements. TIP: When ever there is a danger of falling, place some kind of solid object to prevent disaster. Avatars need railings, walls or even a slight hump sometimes to channel their movement and overcome occasional inadequate navigation. Even a transparent barrier would be helpful and not interfere with the visual effect. It's quite simple, really - just assume all your visitors are drunk and stumbling around! Head Space: All avatars by default have their camera position behind and above them. That way you can see exactly what your virtual counterpart is doing, and with whom. Unless, that is, there is a wall or roof in your way. Cramped quarters are really difficult to deal with, especially if the Grid is laggy. TIP: Building material is free in Second Life: you can afford to have taller rooms that accommodate the normal camera position. Make rooms with very tall ceilings. Or better yet, don't have any ceilings! In some cases, even walls aren't really necessary. Curves: The last time I looked, my keyboard did not include a curved arrow. That's why I have a lot of trouble walking accurately along curved walkways. Avatars can most easily walk straight, but curves are harder to follow. Spiral staircases are the worst, and few can successfully navigate them without bumping into the walls or falling off. TIP: Don't build curves for avatars to traverse. Do build curves for avatars to admire. Dexterity: While it is easy to click with a mouse, it's difficult to do so when you must do so precisely. A vending machine with tiny buttons is not good, since it becomes very easy for someone to push the wrong buttons. Misdirected clicks often happens on websites, and it happens in Second Life too. TIP: Click areas should be sufficiently large to avoid any confusion with neighboring buttons. This is especially important for buttons that perform actions that count - like paying money or ejecting that annoying person from your land. Use contrasting colors to ensure they stand out and are identifiable. Smell and Taste: As I said in the previous ergonomic post, thankfully these senses are not yet implemented in Second Life. I can imagine what some people might do if they were. But how can you reasonably approximate these senses? TIP: Since smell and taste are absent, you must use a visual experience to hint or remind visitors of smells and tastes. Appropriate images, carefully chosen particle effects, sounds and textures can sometimes convey a message of smell and taste. Item Layout: Upon entering a store or gallery, experienced avatars simply stay put and motor their camera around to check out the wares. Unfortunately, most younger avatars (and even some old ones) are poor camera drivers. Instead of camming they move their avatar around the area, turning and pausing to examine every item one by one. They walk, turn, tilt, examine. Then repeat. And again. How many times must they do this? Sometimes once for every item in the store or gallery. This is at least tedious and sometimes frustrating when the lag demons are prowling. TIP: Make items big enough to see clearly (especially product boxes or photo displays), but not so big as to cause enormous amounts of walking and turning. TIP2: Consider displaying items in a circle or semi-circle, where the avatar needs only rotate to easily view a lot of items. I use this technique at my store, and it has proven quite successful. Even better, it really isn't that difficult to build. Wide Size: Yes, I know the diving board ladder looks realistic, but it is a huge pain in the a** to line up your avatar precisely so that when you go up, you don't fall off. Similarly, smaller doorways are often hard to get through, especially if you have a larger avatar. TIP: Assume that avatars are large and size things accordingly. Also assume that it is hard to navigate precisely, so don't make things very narrow if you expect avatars to use them. Use invisible railings or equivalent if there is danger of falling off. Colors and Textures: Avatars have relatively poor eyesight. They often cannot see distances clearly and even up close they can't make out details unless they are able to zoom in. Also, sometimes poor graphics capability means they can see only a limited amount of textures. TIP: Try to minimize the number of textures in use, so that once a texture is loaded, it is rapidly displayed on all applied surfaces. If you use many different textures, visiting avatars will spend a long time rezzing all the textures and generally experience local slow downs. And those are some ergonomic tips for you. As I learn more, I'll post a follow up article with new ones in the future. Good luck with your build! Once in a long while I accidentally make something that I believe is very interesting, and Mini Candles is certainly that. What are they? They are simply small versions of the giant Roman Candle effect I released earlier. Five colors (red, white, blue, green and gold) are included in the Mini Candle kit. So? What makes them interesting? Since they are copyable, you can make lots of them - and then merely by linking them together they automatically synchronize and act as one unit. In other words, you can instantly create a "bank" of roman candles that fire at exactly the same time. Since they have "COPY" permission, you can use as many as you dare to create the most outrageous fireworks displays ever! 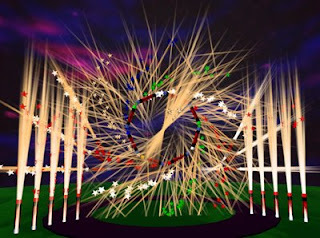 By making enough copies and arranging them in the appropriate patterns, you can create banks of roman candles that fire in coordinated sequences within minutes. You can make a wall of white or a circle of red or a star of gold. Still not convinced? Using Mini Candles I was able to quickly create the display pictured here, which includes a ROTATING pinwheel! Feel free to drop by Electric Pixels to see this in person. Well, "in avatar", at least. I will leave it up on our stage for a while. And you can use Mini Candles not only for fireworks displays, but all sorts of interesting applications: parties, themed areas, animated sculptures and even secret initiation ceremonies. Well, having never been invited to a secret ritual, I gotta assume that's what goes on in them. Doesn't it? Mini Candles. It's not just five roman candles - it's a fireworks construction kit! There are three unusual new items at Electric Pixels this week, and they are of a type I've never made before. I've created a new category at the store called, "Gadgets". These are definitely not particle effects you would ever want to wear, but they may come in handy in certain situations. The first gadget is one of the most complex items I've built so far. It's a Gas Burner! You can place these on your virtual stovetop to make it look and operate just like the real thing. 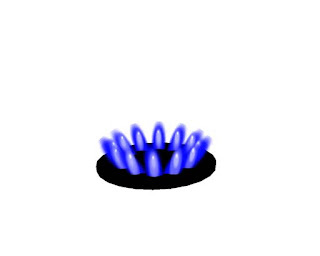 Flickering blue-white flames come from the emitter at a touch. Touch again and you go through all the settings: Off, Low, Medium and High. Just don't burn yourself! The box contains a set of four, suitable for most kitchen installations. Particle Fence: It looks like a simple cylinder, but when you touch it, a series of highly-visible fence boards appear in a circle around the emitter. By default the radius is 10m, but with a simple chat command you can change it to any distance from 1m to 96m. Definitely not for use on the dance floor! Particle Sphere: A two-dimensional fence is not what you need? Three Dimensional required? Well, the Particle Sphere performs precisely the same operation as the Particle Fence, but in a sphere instead of a 2D circle. No fence boards, it uses little dots instead as seen in the picture. Both Particle Fence and Particle Sphere have large emitters so that you can easily find and click on them from a distance, and both also have an automatic shut off to avoid having them pollute your space with particles. Amazingly, all three of these products were inspired (well, suggested might be a better word) by my blogging friend Peter Stindberg. Thanks muchly, Peter! The best ideas for new products are always found by talking to others who need them. 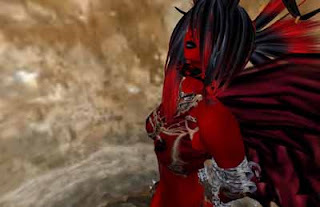 There are a lot of Second Life related videos out there, including in-world machinima. 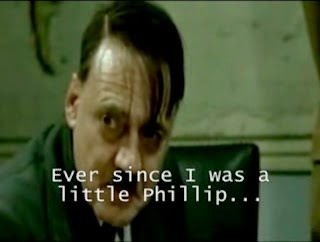 But tonight, new friend Martin Maxwell pointed out a totally hysterical Youtube video, in which Philip is played by none other than Hitler himself. Don't watch this if you have to keep quiet, because you'll be howling. This week I happened to be helping a friend set up a display for a Second Life snapshot contest, including assisting the selection of photos. But we had a disagreement over which pictures were most appropriate. We deferred to the contest rules in an effort to determine which photos were permitted. The rules contained the usual, such as no photoshopping, must be PG material, etc. But hidden inside was one other ominous rule: No Particle Effects, or as the rules stated, “No Poofers”. It's what I call, “Particle Prejudice”. When others declare that particles do not belong in Second Life. I've had the same thing happen to me many times. A typical scenario involves visiting a new location, and I might discreetly start up an appropriate and minor particle effect just to add to the visual experience. Suddenly the owner or manager charges up to me and says “Turn that OFF Immediately!” and “You are causing LAG on the server!” Since it usually isn't my property, I turn it off. And leave. There seems to be a peculiar type of paranoia regarding particles. Sure, if you have a really crappy graphics card, your PC might be unable to render all the particles, but that slows no one else down. Some may call this effect “lag”. In fact, most people don't seem to realize that particles usually have very little to do with lag. At my shop, Electric Pixels, there are often several effects running simultaneously. Does this slow things down? Not in the slightest. Server stats remain stable and running quite well. My experiments tell me that the single biggest factor of sim lag is simply the number of people within it. 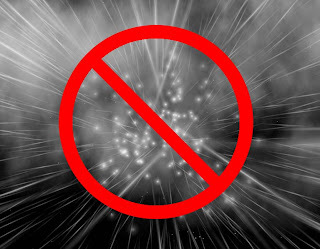 A single particle effect has virtually no effect on the sim whatsoever. Yet, you'd better shut that effect off Right Now otherwise you'll crash the sim! 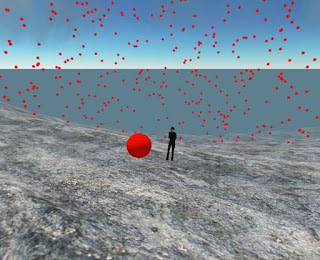 When used correctly, particles can transform a Second Life scene from a lifeless stack of objects into a living, breathing environment, in much the same way as sounds can. I've found many people really enjoy particles. Some are my customers and they collect effects of all kinds. 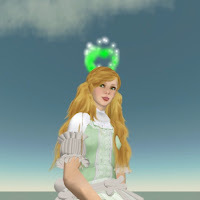 But others, particularly older avatars who rezzed years ago tend to avoid them, or worse, actively try to get rid of them. Perhaps this is a phenomenon originating years ago when servers were slower and PCs were far less graphically capable than today? Or maybe it's due to the griefers who abuse particles to disrupt public events. They are the bad guys. And the rest of us? We're not the bad guys! We just love particles and use them appropriately. Don't shut us down, save it for the griefers. Meanwhile, after the flames were positioned, Veyron took me for a tour of the rest of her industrial build. 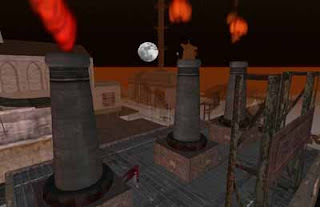 While there are some large buildings like the "factory", which has the three smokestacks, the most interesting part is deep underground. In the basement of one building a passageway opens into some truly incredible sewers. The highly realistic underground tunnels twist and turn, leading you below ground between the buildings. Dirty walls, "aromatic-looking" water and assorted trash add a certain ambiance to this subterranean wonder. The next day in RL, someone asked what I was up to last night. "Oh, nothing much - I drowned in a virtual sewer with a demon." Another typical day, in the sims of Second Life. Reliability. We all face this one several times a week. The Grid is down. You can't rez objects. Well, maybe if you repeatedly try 79 times it may work. Or 80. Maybe on the 81st? You buy something and you don't get the item delivered. Then you have to call ArminasX to fix it. Sigh. Less Lag. There are some days when it's just very difficult to move around, frame rates drop, typing becomes painful torture and just forget about doing any precision work. Meanwhile, an inspection of the Sim's health via the statistics bar reveals that it is "running perfectly". What the heck is wrong? I can only conclude that there are other factors involved causing lag and it really bothers me. And my customers. Because there aren't any when lag is bad. More Capacity per sim. You get 30 avatars and things start creaking. Forty and it's just about dead. More, well, that rarely happens. It would be nice to reliably load more than 40 into a sim. Easy Interface for Non-Builders. According to many observers, it seems that only about 10% of newbies survive to become active residents. Worse, many of these poor folk don't even make it out of orientation. Why? Because the client interface is far to complex for most people. It's designed for people to create content. That's good if you are builder, familiar with 3D development environments - but most people aren't. We need more residents on a grid that works smoothly. 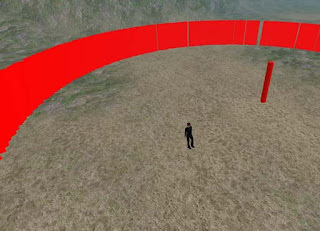 The Second Life client's interface is a big barrier for them. Inventory Management. I have around 10,000 items in my inventory. Some of my friends have 20,000+, and I am quite certain others (and you know who you are) have much more than that. And how exactly do we keep track of our inventory and manage its contents? With a dinky inventory window full of anonymous folders. Folders don't work on PCs with 10,000 files, and they don't work for SL inventory either. Isn't there a better way to manage items? Less Griping from Media. Every time I see a post about Second Life in a non-SL blog or media outlet, it is invariably neutral or negative. Worse, there will always be a series of comments that dump mercilessly on SL, but clearly have no idea about SL and more than likely have never used it. Can't someone (other than us SL bloggers) write about the amazing and wonderful things taking place in our virtual reality? The Linden's value rises by a factor of two-hundred and fifty! Hah - just kidding. It just would be nice one day to see my account have real dollars in it instead of Lindens! On the other hand, would I want pay US$800 for that pair of virtual pants? I saw someone wearing a halo the other day, and thought I'd see if I could make one too. I'd never made precision-aligned head ornaments before but perhaps I was up to the challenge. It turned out that it was actually quite straightforward to build the halo, which is modeled here by Haley Salomon. They slowly bubble upwards, fading to a brilliant white. Haley is wearing the green version (naturally, because everything she owns is green, or at least that's how it seems.) Although I truly like green, I just had to make a few other colors. Eleven, actually: Red, Blue, Yellow, Black, Purple, Indigo, Chartreuse, Fuschia, Pink and Sky Blue. And one more: a very special Vampire version that is Red and Black. I've received positive feedback on these from several testers, and I hope you like them too. If you happen to like them a lot, you can buy all colors at once in the "Halo Collection". Available now at Electric Pixels! Ok, so I know that people make Second Life pets, and some of them even follow you around. My neighbor in Caso Milo has a wonderful pond with apparently artificially intelligent ducks. I've seen birds flying through the sky and I've ridden elephants for a laugh. But last night I saw something a little different. As I was working with Veyron Supercharge on her evil "Sweatshop" build (I am making some evil-looking flames that will burst from the industrial-style smokestacks), she showed me an interesting sight next door at her South Gate parcel. This small build contained a rather creepy looking sculpty tree (made by Seph DaSilva) with matching ground terrain. However, once we were nearby we were assaulted by ghosts! The "Spectre", made by Lyle Maeterlimck of Liquid Designs, slinks around the tree area and rushes up to unsuspecting passers-by. More ghosts are spawned and it gets pretty spooky.